Omnes Delta Horn is a backloaded horn with BB 8.01 fullrange driver from Omnes Audio. Omnes Delta Horn has been developed by Thomas Schmidt. The crossover consists of three serial blocking circuits and a impedance correction to flatten the frequency response. 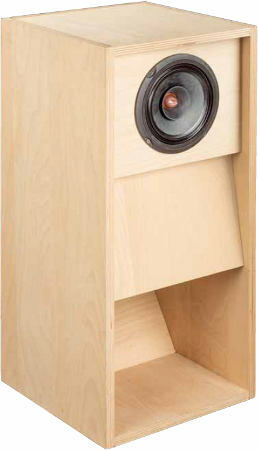 The frequency response of this speaker is balanced. The decay spectrum is nearly perfect. At low volume, i.e. 85 dB at 1 m, the nonlinear distortions are lower than 0.5 % above 400 Hz and doesn't exceed 0,5 % at 95 dB at 1 m .
The high-end kit is delivered with a baked varnish air core coils for minimizing microphonic effects. - The current flow through the coil creates a magnetic field which sets the reel of wire in motion. This motion induces a voltage in the coil which adds itself to the signal. The stiffer the reel of wire is, the less the signal will be altered. The capacitors in series to the fullrange driver are high quality capacitors of the type Clarity-Cap ESA 630 V.